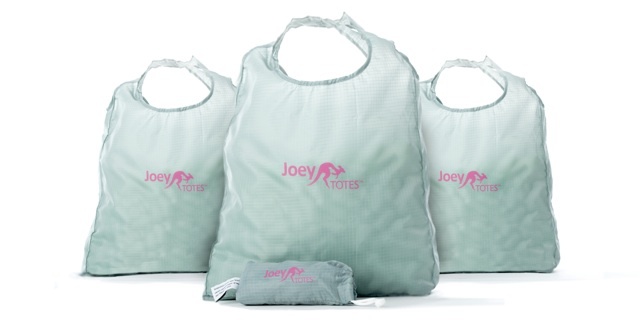 Joey Totes are the all-purpose, reusable bags that stow easily in one pouch so even a set of 3 can fit in a small purse. Use them as a travel bag, at the beach, as a gym bag, at the mall and, yes, even at the grocery store. The 2 sizes let you carry one over your shoulder and the other in your hand. You can carry 40 lbs. in each bag (wow!) and can even put them in your washing machine. Best of all, your Joey Totes will help replace thousands of disposable bags each year. Where’s your Joey? … always with you.